Cosmetically Grand - both for your eyes and ears! Red & Green's Star-Filled Super Saga! 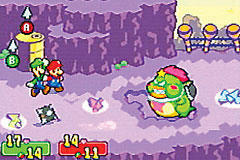 Prepare to bounce koopas to submission in this spiritual successor to Mario RPG. 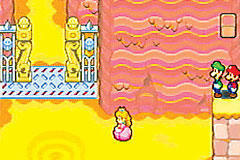 Mario & Luigi: Superstar Saga starts out simply enough, with a gift from the queen of the Beanbean Kingdom. You'll soon enough find yourself partnering up with King Browser in this quest to restore justice (what did you expect?). Along the way, you'll meet plenty of new characters and their exotic locations including Hoohoo Village (based on a waterfall), Guffawha Ruins (desert), and the Beanbean Castle's plumbing system. These varied backdrops help make great a very visually pleasing Game Boy game, that is also supported by highly detailed character sprites. The sound is quite pleasant as well, with a number of wacky songs and themes to compliment the solid sound effects. Now are you ready to bounce on some koopas? I hope so, because you're be doing plenty of that, along with several dozen other types of enemies that stand in your way. From the combat menu, you'll be given 4 main commands: single attack, Bros. attack, run away, and item. 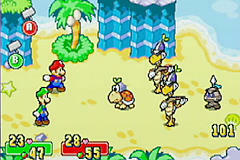 There is no defend, because it's placed upon the player to dodge oncoming attacks with the all mighty "timed" system. As an enemy prepares to attack, they will give certain clues as to which character they have chosen to attack, and which attack will be used (and most have 2 or more! ). The player must then to decipher the clues and make their best effort to dodge the oncoming attack. This will come in very handy later on in the game, as you aren't going to get by eating mushrooms during and after each battle. The super awesome "timed" system is also in effect for Mario and Luigi's attacks, as there will be a brief moment to push either the A or B button shortly before making contact with the opposer. Sound like fun? Well, it is, and it's much more enjoyable than those sleepy games that only involve selecting commands. Now, the Bros. attack that was previously mentioned, is another applause-worthy feature. 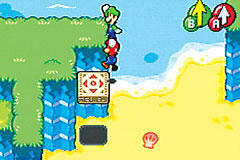 This is where more Mario and Luigi join force to help each other make a more powerful attack! As you gain more practice, you can move onto the more difficult setting of the Bros attacks, and the attacks themselves will also advance in ability over time. The 3 setting of Bros attacks is one of the big reasons I rated the the learning curve an A+, because each setting is a little bit harder, and allows each player to gain ability at their own pace. Not to mention the amount of help you'll receive from the various inhabitants of the Beanbean Kingdom. Throughout playing this madly wacky, cute-fest of an RPG, the participant will enjoy multiple plot twists in the ongoing saga for Beanbean Kingdom justice. The story is well portrayed and the dialogue is typically more enjoyable than previous installments (see Mario RPG [Super NES] & Paper Mario [N64]). You will constantly be in transition from meeting goofy "NPC" characters, to traveling the kingdom, solving puzzles, and all the while having plenty of fun while doing so. I won't ruin any of the spicy details, but you'll definitely be surprised what kinds of trouble Mario and Luigi find when partnered up. There will also be some cute and interesting side quests that are worth searching for, but again, I won't mention details. As you can tell, I really have almost nothing to complain about here. Probably the biggest issue is the difficulty level, which many older fans may not enjoy too much. The game isn't that easy, and there are a few boss fights that will have you on the edge of your seat... but I can definitely see some people wishing there was a higher challenge. Don't let this deter your interest though, it is most definitely playable, and worth every penny you will fork out for the beauty. 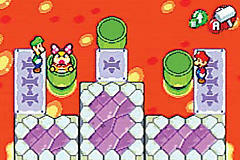 In review, I give Mario & Luigi: Superstar Saga a sparkling A.